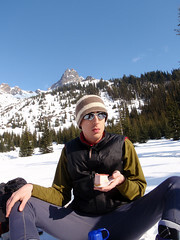 Here I am with a slice of cake with Cutthroat Peak in the distance. Start your day with cake. We did have plastic sporks but it was decidedly easier to eat from the hand.